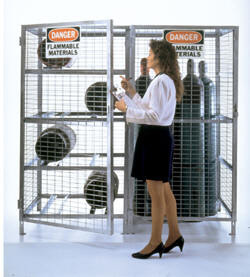 Combination Galvanized Cylinder Storage Cabinets. Store cylinders of all sizes in these heavy duty Cylinder Storage Cabinets. Made of all steel construction, this rust resistant unit has steel angle frames, 8 gauge galvanized welded wire and a 12 gauge galvanized steel roof. The galvanized rust resistant finish stands up to harsh indoor and outdoor environments. Units can hold 8 units horizontally and 9 units vertically. Features a padlock hasp for security (padlock not included), "Danger Flammable Material" sign, and all necessary anchoring hardware. Meets OSHA 1910.110 requirements. Assembly required. Specs: Overall Size 58"W x 29"L x 66"H.